Oak was first used for furniture making in Europe in the 15th century. In the 18th century, American furniture makers discovered the wood where it is also plentiful. Oak is resistant to fungus or insect damage due to its high tannin content, making it ideal for furniture that is both durable and attractive. This era is also known as the age of the Carpenter. Oak is classified as a hardwood with a medium to coarse texture. It ranges in color from yellowish brown to dark brown and can grey with age. The biggest shift in the oak period was the change in domestic life. Homes were no longer considered forts or great assembly halls. Elizabethan homes were smaller with more and differently purposed rooms requiring new types of furniture. Luxury began to commingle with practicality. The Medieval period was during the 15th century. 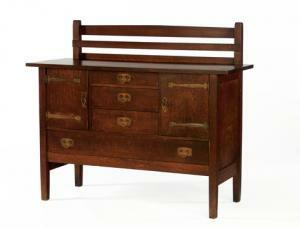 Chests were the predominant form of furniture and began simply as hollowed out chunks of wood. Later chests were made with framed-up panels that worked with the wood grain and made for a useful, decorative piece of furniture. During the 16th century, the Tudor, Gothic, Renaissance, and Stuart styles evolved. Elizabethan tables begin to evolve as the direct descendants of the framed-up panel chest. First came the simple trestle table, then the more solid dining tables with extending leaves, stretchers, and bulbous legs. Side tables such as night stands and console tables came next. There was much overlap between Elizabethan, which was the late 16th and early 17th century, and the Jacobean, which was mid-to-late 17th century, styles. 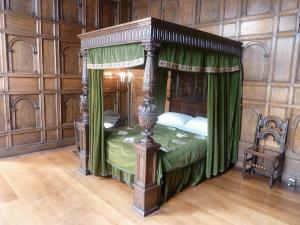 During these oak periods, bedroom furniture came into being with bedsteads and wardrobes. Beds themselves were made in four poster and panelled styles with canopy beds draped in upholstery. The styles of the early oak periods up to the Elizabethan period were practical with little extraneous decorative elements. Generally, the style in the Elizabethan age was ornamentation with a purpose such as to soften edges. In the later Jacobean period, ornamentation took off randomly in whatever direction the carpenter chose to take it. Later European furniture styles did not favor oak. Furniture from the 18th century onward was made predominantly of maple, mahogany, cherry and walnut although the Queen Anne style (1725-1750) sometimes incorporated with oak into the furniture, particularly in tables. Oak became popular for making furniture again in the late 19th and early 20th century. 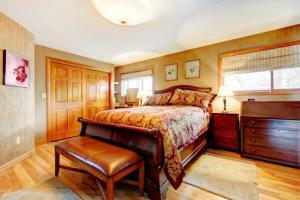 Bedroom furniture from the Oak Period rarely comes up for purchase due to its early origins. The prolific Arts and Crafts Period of the 19th and 20th centuries produced many pieces that can be found throughout the United States today. No discussion of antique oak bedroom furniture would be complete without mentioning the Arts and Crafts movement which was in the late 19th through the early 20th century. This movement was directly counter to the extreme elaborateness of the Victorian style so popular in the latter part of the 19th century. Many of the Victorian furniture pieces of the time were not only overly decorated, they were cheaply and poorly made. Yes, they were mass-produced and affordable, but were not aesthetic and were not built to last. Arts and Craft furniture was simple, artful and made of durable oak. Its hallmark was elegant simplicity. Gustav Stickley was the best known designer of this period and his work has become popular again, particularly the antique furniture made between 1901 and 1904. His signed works are rare and avidly sought after by collectors. A signed Stickley sideboard sold to Barbra Streisand for $363,000 in 1988. The auction house, Christie's, gave it a pre-auction estimate of $90,000, Ms. Streisand sold it in 1999 for $595,500, thus illustrating the volatility of the antique market. Gustav had four brothers who began producing Stickley style furniture in 1904. Their company was known as L. & J.G. Stickley, which continues to manufacture this style of furniture today, though only furniture produced up to 1916 can be considered antique. This is because the definition of "antique" is anything at least 100 years old. Furniture marked Gustav Stickley or L. & J.G. Stickley adds to the value of the piece, with the Gustav Stickley mark the rarest and therefore the most expensive. Unsigned pieces, of course, go for considerably less and may rival the price of any good quality piece of furniture sold today. Prices for antiques outside of an auction setting are almost always negotiable. 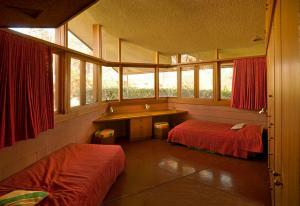 Other notable furniture designers of the period were Frank Lloyd Wright and the Greene brothers, Charles and Henry. They had much in common. They were homebuilders as well as furniture makers, they were intent on connecting their structures with the natural settings in which they were built, and their furniture designs were very much a part of the interior spaces. Arts and Crafts furniture makers followed the philosophy of the functional, pared down designs of homebuilders like The Greenes and Frank Lloyd Wright's Prairie style. The only way to date antique furniture is in person, face to face with the piece under consideration. The process should contain the following basic steps although you can do a more detailed age determination if your initial examination still leaves you stumped. Note how the pieces are connected. In a highboy dresser for example, look closely to determine if it was all made at the same time. If there is a top piece and a bottom piece with elements that are not similar to each other, chances are the dresser is a "marriage" of two different styles and ages. The resulting item may be attractive and useful , but should not command a lofty price. Check for condition. If it is over a century old, it should show some signs of wear as well as marks from hand tools such as planes and chisels from antiques made prior to 1860. Such marks will be more prevalent on the back and inside of the piece. Check the hardware for obviously machine made bits. Again, any item made prior to 1860 will not have hardware resembling today's. No two screws will be alike and the brass fittings should be in the style of the period. If possible, check the underside of the fittings. They will probably be rough due to the types of molds used at the time. Pull out the drawers. There should be dovetailing that is not uniform. Hand cut dovetails went out of use in the 1930s. After that, electric power tools were used. The difference is very clear to even the uneducated eye. Hand cut dovetails are fit into each other, but not all the joins are exactly the same. Machined dovetails are uniform. A good place to start your search is from an antique dealer you trust. Visit antique fairs even if travel is required, but be prepared to handle delivery of your purchases yourself. Auctions are also fine places to purchase antique furniture. The high-end auctions houses such as Christie's, Sotheby's, and Phillips provide catalogs so bidders know what to expect at each auction. Most auction companies will display the goods that are coming up for bid on site to give potential bidders a preview of the lots that will be on the block. Don't overlook swap meets, flea markets, garage and estate sales. Such events can be located through magazines and pamphlets often available at your local antique store. Even thrift or second-hand stores can be treasure troves for the savvy antique shopper. Furniture made of oak was predominant from the 14th to the early part of the 17th century when it lost ground to other hardwoods. Oak furniture made a resounding comeback in the late 19th and early 20th century with the Arts and Crafts movement. The vast majority of antique oak bedroom furniture will not be marked with the date or name of the manufacturer or the wood from which it is made. This is why knowing how to determine its age will lead you to a more accurate identification of the piece. You will not only be more certain of its authenticity, you will have a better base with which to negotiate a fair price.